The kids have moved out and it is time to explore! Oh, how we have dreamt of this time in our lives. Visions of laying on the beach, reading and not worrying about any children getting swept out to sea, are gold! The dream is about to become a reality! The possibilities are endless! 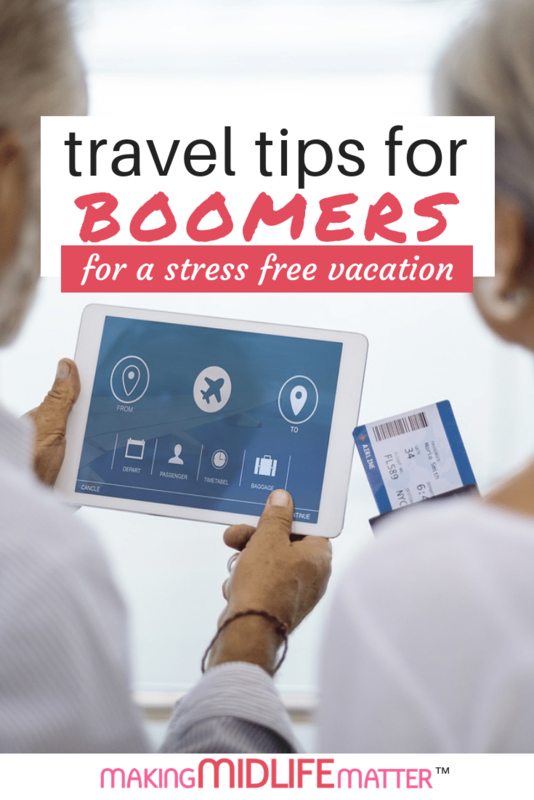 But before you get going, here are some travel tips for boomers that will ensure not only a good time but a stress free one too. Set your sights on the unknown and book a trip with a travel agency. Agents are experienced with finding a great match for midlife travel vacations and they can actually customize your trip. Many do not charge any fees, as they are compensated by the venue itself. If you are looking for a reference, post on Facebook and you will get honest reviews from people that you know. Take safety into consideration. Booking with a group is always fun, especially if you are a solo traveller. Whether with friends, family or just the two of you, look in to travel advisories prior to making your reservations. The U.S. Department of State has a complete list to review. At our age, it is worth it to pay some extra moolah for travel insurance. Chances are you won’t need to cash-in, but if you do, it’s nice to know you won’t lose any funds. A few years ago, we had to cancel a trip and it was easy peasy! Apply for or renew your passport. Do this way in advance so that you are not sweating it as your trip nears. It would seem that packing would/should be so much easier. You pack your stuff and the hubby packs his; no packing for kiddos. This is a great concept but now you have all sorts of time to add to your pile. There was never time to focus on your own belongings before. A 50 pound weight limit? Are you kidding me??? Why can’t I take a different pair of shoes for each day? Dwindling my wardrobe is NOT my strong suit. The best midlife travel tip for packing… make sure that you weigh your luggage prior to arriving at the airport. 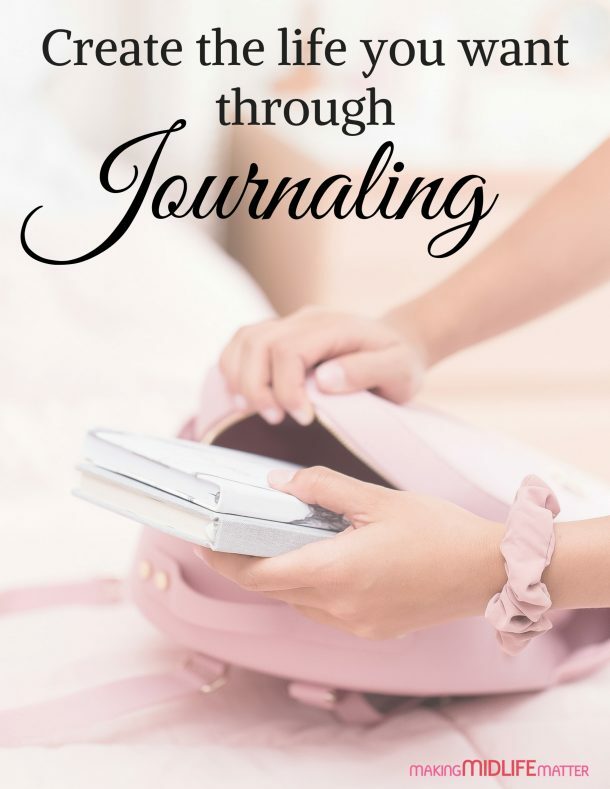 Opening your suitcase in the check-in line and stuffing your purse and carry-on, does not make for a stress-free experience. It is also a sure-fire way to put your husband in a sour mood and that will put a damper on all the fun. For many of us, daily medication is a must. Plan to take double the amount that you actually need. It would be horrible to be stuck in wonderland without the magic blue pill! Confirm that you have extra refills available at your drug store. Filling these should not be too hard if you need to. Keep a list of your meds with you too. Just in case. Another boring medication fact… be sure to wear sunblock. No, I am not going to lecture about our potentially thinning skin. Instead, some prescriptions will actually increase the risk of sunburn. Check with your doc or pharmacist for details. Midlife travel means that your home will be empty while you are away. Inform neighbours and ask them to watch your house and grab your mail. Give your adult kids the job to watch your critters – it is pay back for all the baby-sitting you have or will do for them! Hire a driver to take you to the airport. Splurge! No need to struggle with parking and shuttles. No need to drag your own 50# suitcase, carry-on & purse through a parking lot and crowded airport! It certainly isn’t worth hearing your husband grumble about carrying your stuff either! Leave for the airport early. Give yourself time to sit and sip on a drink before you have to board. It will be well worth the relaxation even if it did cost $15 for one drink and you have to pee it out before you even get on the plane! The last midlife travel tip… avoid guilt. It can consume you and ruin your trip. You have worked hard and deserve a break! Not sure where to go? 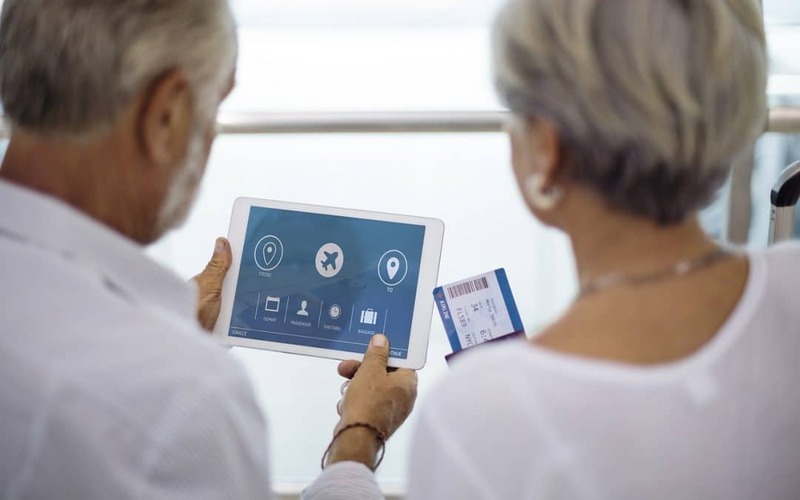 Here are some more destination travel tips for boomers. Or does full-time travel interest you? Live it up! Keep making awesome memories and enjoy every minute you have been blessed with! Read about me and how I have reached the point where I can travel in midlife. Hi! I am Lisa. A bit of my history… I was married and had my first child at 17. My hubby was my legal guardian; he was 18. We have been married for 35 years (tons of stories to tell :)! We have 3 adult kids, 5 grandkids and a 6th due in June. I have dabbled in a lot through the years but nothing really stuck. In my mid-forties, I had a mid-life crisis and went to nursing school with my middle daughter. I became an RN at the age of 47 (I am 52 now). It was the worst decision in my life. Nursing is not for everyone – not for me! I jokingly tell my husband that I should have had a normal “crisis” and had an affair. Then at least I wouldn’t be in a job I hate! Not sure he thinks it’s funny, especially because he loves my checks! Money over matter! Anyways, I took a leap of faith and jumped right in to the blogging world about a month ago. I am a complete virgin – never thought I could say that again! Come visit me at Gather Love.